How good is your CV? You don’t need to be actively looking for a new job to need an up to date CV: you never know when that opportunity you’ve always dreamed of will knock on your door. And in today’s volatile world, things change quickly and few of us are in a job that is likely to be our last one. In a competitive jobs market, a good CV will greatly increase your chances of getting an interview for the job you want. But how much thought do you really put into it? It is well documented that you get a matter of seconds for your CV to make an impact – the difference between interview and rejection. Does your CV have that impact now? This short booklet will help you to create a CV that gets you noticed. The booklet is written by John Hamilton who has recruited more than 2000 people, viewed tens of thousands of CVs in all industry sectors and supported hundreds of individuals through career coaching and transition. 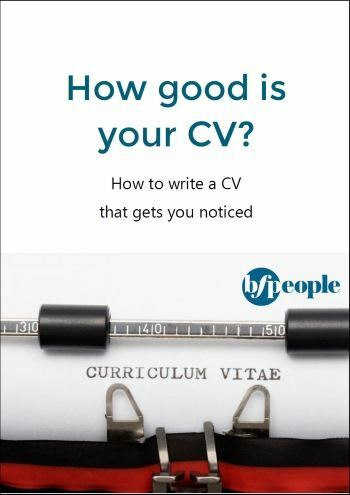 This is a guide for everyone who wants to write an effective CV. If you need further advice, call bfpeople on 0333 202 2225 or click below to get things started.